Relax and get away to the north Georgia Mountains. 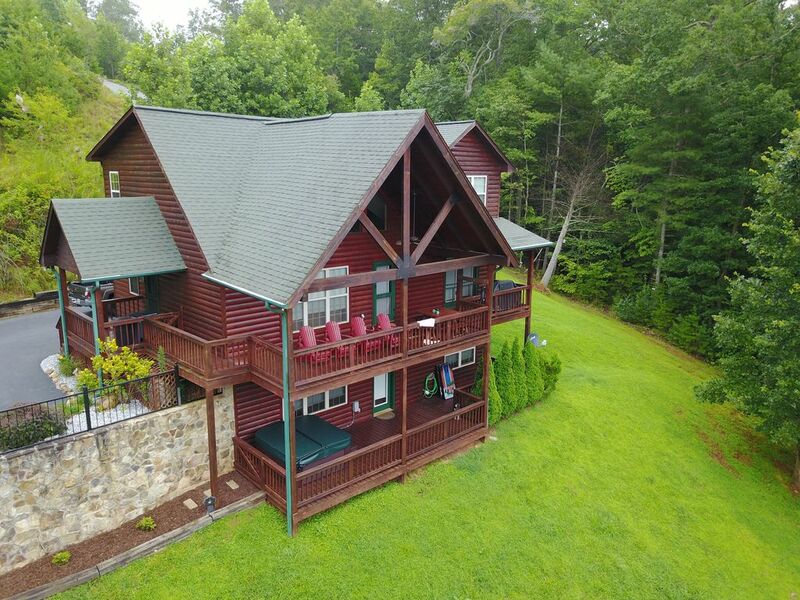 Enjoy some time in this beautiful 4 bedroom mountain cabin overlooking the beautiful north Georgia Mountains. Spend time in the hot tub and then enjoy a game of pool with the kids. Upscale Log Cabin with long range winter and summer views of the North Ga. Mountains. This WONDERFUL 4 bedroom/4.5 bath rustic retreat featuring 1.7+ acres, with paved driveway is the perfect place for your next vacation. Finished Basement has a den with large screen tv, wet bar, pull out couch and separate bedroom with queen size bed. Main floor has Cathedral ceilings w/ exposed beams, wall of glass to take in the views, and an open kitchen with center island. The bedroom on the main floor and both bedrooms upstairs are masters with private baths. Balcony has room for games and comes complete with outdoor gas grill, Adirondack chairs and picnic table. 2 levels of porches to soak in the yard and views. Complete with pool table and game room. Cable TV throughout the house and master bedrooms have tv inside the rooms. In all, house sleeps a total of 10. Local phone, washer/dryer, and gas fireplace. Outdoor wood fire pit (with seating) to enjoy the night air and plenty of space for the kids to play or adults to enjoy the fire flies. Just minutes from Vogel State Park and Brasstown Bald. Located close to Appalachain trail, numerous wineries and the tubing in the summers. A scenic 20 minute drive to The German village of Helen and historic shopping district in Blueridge, GA. Whether you are looking for adventure, family fun or just a peaceful escape Big Sky Overlook cabin is the place for you. Master with King Bed on main level. glassware sufficient for maximum number of guests, toaster, grill utensils. Great property that has some fixable issues. Just what we expected. Upon our arrival we were welcomed by some of the staff as we arrived at the site.very curteous and informative about what we needed as wishing us a wonderful stay. Our stay was just what we needed and expected. Lots of rest and family fun. We were here with friends for a long weekend. We enjoyed the cabin and the surrounding areas. This is a great place in a great location at a good price. The kitchen is stocked like a regular home so you need to bring nothing except food and drinks.